I’ve not written advice on DMing before. First of all because there are so many great channels out there. Runehammer, Matt Colville and lately Jim Murphy. However, in Runehammer’s latest Patreoncast “Mainframe 39: More than just talk!” he brought the disconnect between the universally accepted advice that shifting the “spotlight” between players is a good thing to do, vs what actually happens is that loud people speak more and can leave little room for more shy and polite people. While I am not as seasoned DM like as the noted gentlemen above, I do have a professional history of running strategic business workshops with executive level participants (Vice Presidents, CEOs, etc). Managing a workshop of 10,15 even 30 high performing individuals who in many cases are used to being the ones speaking, the ones being in the spot light, is hard. And to do so I am trained in various workshop techniques and have learned some tricks along the way. This one is much much harder in your mind that in reality. In your mind you believe putting your voice above your friends is wrong and means you are not a good collaborative friend. However, in the minds of your player, they expect you to do this. This have joined the table expecting to relinquish authority to you as the person running the game. Do not be afraid to cut people who speak too much short. Don’t be rude, but don’t linger. Basically stop them. You say: “Hold that thought for a moment” and as you do this you hold up your hand flat towards the person as the universal “stop sign”. As soon as the person stops (only even if it is to take in your command), you look straight at the person you want to speak up, point at them (or their miniature) and say: “What do you / does Elephel the Ranger, do next?”. Do not rush the person. Do not move away from the person. If you feel somebody you’ve shut up gets a bit offended then do not take it too heavily, the lesson will do them good in life. But do make sure that they DO get their turn and their say. Putting a shy person in the spotlight can be scary for the person. One way to avoid this is by specifically calling out two players where there is some synergy, one being the shy player. Let’s say Jim, the shy player plays a Cleric. Jane plays a Paladin, John and Jill plays Barbarians..
John, Jill and Jane are all talking over each other about some holy markings on the wall. You stop them all and look and point first at Jim and you say “Jim, holy stuff is something you know about right?” (don’t make this a statement, make this a question so it feels like the players has a choice. They do not). Don’t wait for an answer, keeping pointing at Jim, but turn your gaze to Jane and point at her with your other hand and say “And as a Paladin your character knows holy things too!” (don’t make this a question, make this a statement so the player know she doesn’t have a choice in the matter). Finally move your two pointing hands together and point at the table and say “I’d like to hear what the two of you being the experts in holy stuff have to say about this situation. If you want to force the issue even harder, you can actually split the party so the rest of the party is literally out of the picture, but this should be absolutely last resort. I use this technique when my players start speaking over each other. To be fair, my current gaming group consists of people working in frontline jobs, HR, design and consultancy, which means they are very good at listening and giving space for each other, but not all groups are and especially younger people and/or people new to roleplaying games can get super excited and forget about everybody else. As soon as they reply, you action it. Don’t wait for any discussion to start whether that is the right thing or whether another character has a better skills stat. No, decision has been made. Let the dice roll and faith decide. As soon as action is complete, you point to the next person and do the same. Important note: If you do this you have to do it all the way around the table so everybody get one opportunity each. If you give a player two opportunities, you have to give everybody two. If you are adding game mechanics to your social encounters (See Runehammer’s youtube video Social Encounters: Decoded), you can also force the issue by having actual initiative order based on CHA.I have never had to do that myself, but I can see how it would take some of the responsibilities off your shoulder. This is kinda cheating and I wouldn’t advice doing this continuously, but prior to the game session you could prep a specific situation that the shy person’s character would know about or have some connection with and simply talk to them ahead of time so they know this scene is coming even if everybody else do not. This works really well as it gives the players some success and confidence and you should never reveal to the rest that this is what happened. This is solely between you and the shy player. I play with miniatures and scenery and more often than not my players will point and describe what they want to do using the “toys”. 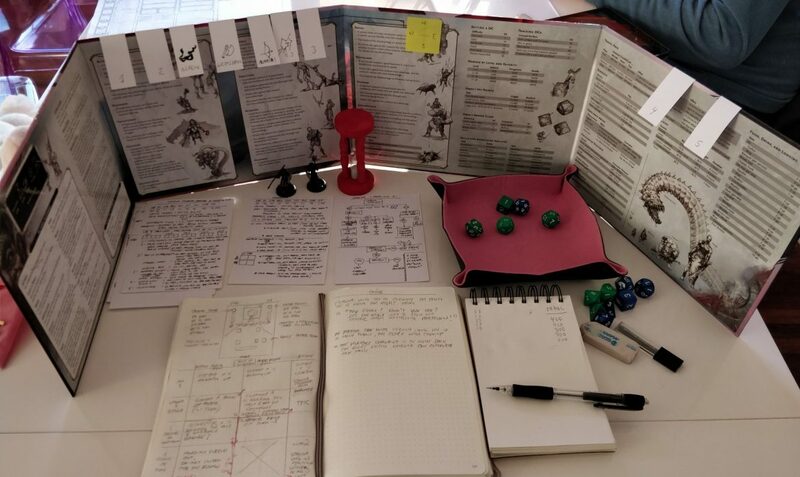 However, if you play theatre of the mind, you may want to consider having blank paper or small A4 whiteboard at hand you can give to players struggling with thinking through what they want to achieve. Getting thoughts down on paper help clarify the topic and easier to explain. My life philosophy is there’s no wrong direction other than not to make a choice. If you make a choice, you can always course correct. However, if you don’t make a choice you will never get anywhere. You will just be stuck. this is very true for D&D. Shorter conversations, more decisions and actions.